If you’re at, say, a science museum, or a nuclear power plant, those are nice words to hear. But when you’re talking about one of the most anticipated Sonic titles in some time, a game meant to make the hedgehog’s 20th anniversary proud and turn his fortunes around with skeptical longtime fans, only one word comes to mind: Alarm. Interestingly, that quote came from playing the “official” demo–which was swapped in after Thursday’s more lengthy but more beleaguered demo went missing. Though the proper demo looked cleaner and felt easier to use, I can’t disagree with the idea; much of what I played in Green Hill and Mushroom Hill felt automatic, like there was no sense of challenge or reward. There are a number of understandable contributing factors to this; chief among them are apparent replications of the original stage’s level layouts and music for classic Sonic, which reeks more of laziness than nostalgia. But where classic stages repeat, modern Sonic stages were supposed to re-imagine the same way the console stages do. Instead, they look and feel uninspired. While there’s some platforming in the modern Green Hill Zone I played, there were also a whole lot of places to grind, and boost. That may be what modern Sonic is all about; that doesn’t mean the game should feel like it plays itself at times. Even with that, modern Sonic’s speed in-game felt unexpectedly restricted, despite the boost ability. That became an issue when racing the falling totem pole at the end of Green Hill Act 2; unless the boost is spammed quickly, players will not make it out from under the shadows. I actually died a couple times attempting that chase. Between that and the areas where I felt no control was necessary, that sense of inconsistency troubled me greatly. 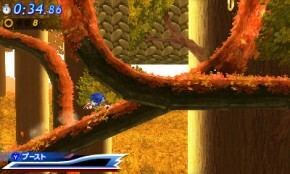 The problems were worse in Thursday’s demo, which had more stages to play and also had a homing attack enabled for classic Sonic. That homing attack actually helped more than hurt when I tried it out in Radical Highway against a couple strings of badniks. 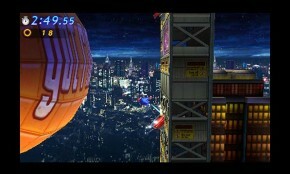 But the stage design itself felt poor and monotonous, aside from one neat point where Sonic is bouncing between a blimp. Those badniks, by the way, looked pretty deliberately set up to take advantage of that attack, in much the same way as how strings of badniks were seen in Sonic the Hedgehog 4: Episode I. In Generations, however, the pattern is more overt. I never lost a life in my play time by refusing to use the move, but in order to access certain paths, if it’s not a requirement, it’s pretty damn close. Classic Sonic in Emerald Coast, however, felt out of control. The area includes, just as it did in Sonic Adventure, a bevy of springs, some of which throw you right into trouble. The whale chases you in Act 1 as well, and it requires some quick thinking through some obstacles, as the animal charges fast and furious. Classic Sonic tended to respond slowly in this build, which did not help me get far during. All that considered, it surprised me when both boss battles on display, as it turned out, were a piece of cake. I raced Metal Sonic in Casino Night, and while Eggman’s metallic recreation had an almost unfair head start, a couple pits allowed me to catch up and leave Metal Sonic in the dust midway through. Whether that’s rubber-banding or not, the experience lacked the sense of urgency and danger the original from Sonic CD–or even its expected re-imagination in Generations’s console counterpart–flawlessly executes. Big Arm wasn’t much better. Not once was I caught in the machine’s claws, a rarity in the original. The skill required to beat Eggman was minimal, his attacks easy to dodge. Clearly, the better experience of the two was that of Sega’s presumed intended, limited demo that had been shown publicly in previous conventions. But choosing favorites here is like choosing between Dumb and Dumber; you’d prefer to just hitch that ride with the Hawaiian Tropic girls instead. Both demos showed fundamental problems with control, level design, and general consistency to a point where I think a delay to 2012 to tighten things up may be quite useful. If that delay does not occur, and we’re left with what I played Thursday especially, I am quite concerned. Sonic Generations for 3DS at the show did not feel like a proper anniversary memento for Nintendo fans. To recall that guy across from me at the show kiosk, it simply felt like I was pressing buttons.